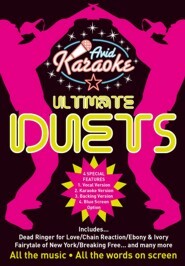 More fun from AVID Entertainment as we present Ultimate Karaoke Duets. Step up with your partner or close personal friend and give it your all to 20 sensational karaoke duet classics. And if you dont have a partner or indeed a CPF, then what better way to find the love of your life than via the wonderful world of song! You might reach for the stars with Up Where We Belong or even do Something Stupid. You may find your Endless Love or decide Youre The One That I Want or even opt for Breaking Free as the only way to be.